Around 30.0% of the value of B2B sales in France was made on credit. This is well below the 41.2% average for Western Europe, suggesting a relatively strong aversion of French respondents to the use of trade credit in B2B transactions. This behavior, which seems to be in common with that of respondents in Belgium, Austria, Switzerland and Germany, likely stems from the challenging insolvency environment currently being faced by businesses in France. Similarly to what was observed in Belgium, the country insolvency rate is around 2%, at a higher level than in 2007. However the average value of B2B credit-based sales in France has increased by an average of 2.5% since the 2015 survey. This growth rate outpaced the average for Western Europe, which appears to be substantially stable. 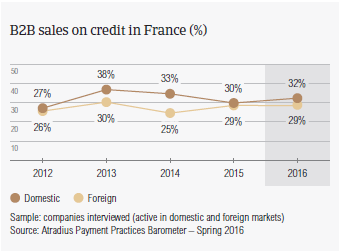 French respondents show no preference for selling on credit to either domestic or foreign B2B customers. 32.0% and 29.4% of the total value of domestic and foreign B2B sales respectively were on credit (survey averages: 44.8% domestic and 37.7% foreign). This reflects an almost uniform perception of payment risk arising from domestic and foreign B2B trade. This is common to the majority of the countries surveyed, except for those in Southern Europe (Greece, Italy, Spain), which seem to be notably more trade credit friendly with domestic than with foreign B2B customers. Consistent with the survey average, 91.0% of French respondents reported late payment of invoices from B2B customers over the past year. This resulted in an average of 46.0% of the total value of B2B receivables remaining outstanding past the due date. This is above the survey average (nearly 40.0%). Late payment of invoices occurred more frequently with domestic than with foreign customers, and increased significantly (+9%) over the past year. Late payment of invoices (domestic and foreign) is reflected in the Days Sales Outstanding (DSO) figure recorded by respondents in France. This averages 50 days (in line with the 48 days survey average) and has remained almost stable over the past year. Despite this, notably more respondents in France (31.3%) than in Western Europe (22.4%) expect deterioration in their DSO over the next 12 months. This may explain why a lot more respondents in France (11.0%) than in Western Europe (8.6%) consider efficiency in receivables management to be the greatest challenge to business profitability this year. A poor assessment of the customers’ default risk is of concern for a greater percentage of French respondents (7.6%) than respondents in Western Europe overall (4.7%). B2B customers of respondents in France are given an average of 37 days from the invoice date to pay invoices (above the 31 days survey average). Domestic and foreign terms differ by only two days, reflecting the already mentioned uniform perception of payment risk arising from domestic and foreign B2B trade. Over the past year, average payment terms extended to domestic customers did not vary significantly. Foreign customers, in contrast, were given slightly more lenient terms for settling bills. 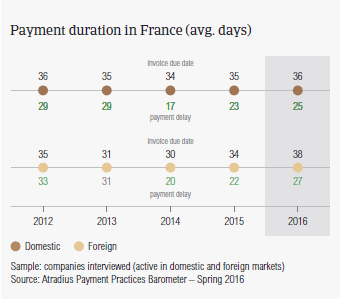 As a consequence of this, French respondents had to wait notably longer than one year ago (around 5 days) to receive payment of past due invoices from B2B customers abroad. Domestic payment delays, in contrast, did not vary markedly. As overdue invoices are settled, on average, within 26 days past the due date (survey average: 22 days), it currently takes respondents in France an average of around 63 days from invoicing to turn past due B2B invoices into cash. This is ten days longer than the survey average. In France, fewer respondents (nearly 53.0%, survey average: nearly 58.0%) than last year (59.2%) reported late payment of B2B invoices due to liquidity issues from domestic customers. In contrast, as many respondents (23.8%) as one year ago (22.5%) expressed the opinion that domestic B2B customers delay payment of invoices due to an intentional use of outstanding invoices for financial advantage. This appears to be a quite strong belief in France. 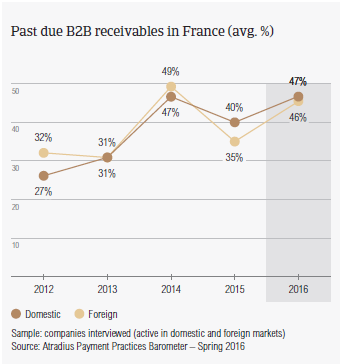 Late payment of foreign B2B invoices due to liquidity issues was reported notably more often (33.6% of respondents in France, survey average 40.2%) than last year (27.1%). No matter why customers paid invoices late, this had a negative impact on the cash flow position of businesses surveyed in France. Late payment further down the supply chain was reported by 21.4% of respondents (consistent with the 23.7% survey average). Notably more respondents in France (nearly 24%) than in Western Europe (18.3%) had to take specific measures to correct cash flow. This may explain why around 35.0% of French respondents (in line with Western Europe) plan on checking the creditworthiness of their customers more often in 2016. An increase in the use of cash and of secured forms of payment over the next 12 months were also notable (around 30%, compared to approximately 26.0% in Western Europe overall). The proportion of B2B receivables reported by French respondents as being written off as uncollectable (1% of the total value of B2B receivables) is slightly below the average for Western Europe (1.3%). Domestic uncollectable receivables were written off almost as often as foreign ones. Uncollectable domestic B2B receivables originate most often from the construction, consumer durables, chemicals and services industries. 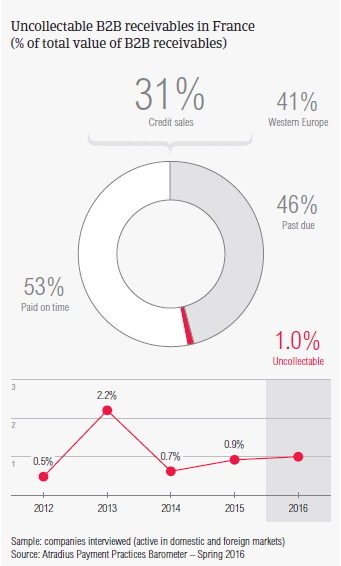 For most of the respondents in France (58.3%) B2B receivables were uncollectable mainly due to the customer being bankrupt or out of business (respondents in Western Europe: 59.3%). Notably more respondents in France (29.5%) than in Western Europe (20.6%) wrote off receivables as uncollectable mainly due to the debts being too old. Survey respondents in France reported granting trade credit terms mainly to B2B customers in the chemicals, consumer durables, construction and services industries. Invoice payment terms extended to B2B customers in the services sector are around ten days shorter than the country average. B2B customers in the chemicals industry take the longest to pay overdue receivables. The construction industry generated an above average (for the country) proportion of overdue invoices. However, according to most of the respondents in France (nearly 60%), late payment of invoices due to liquidity constraints from customers occurred most often in the construction industry. On the contrary, late payment in the consumer durables industry most often resulted from the formal insolvency of the customer (33.0% of respondents). Three in five respondents in France (just over 60%) expect payment practices of B2B customers in the consumer durables industry to deteriorate slightly over the next 12 months. No significant change is anticipated in respect to payment practices of customers in other industries.